Sunday, December 14, 2014 – Laser Fleet Race and Hobie Cat Fun Match Race! On 14th of December the PCYC was running its first laser fleet race with 7 participating boats. Thanks to everybody who participated and came to cheer on the keen racers! Congrats to the winners of the Laser Fleet Race: 1st Robbie Yearwood, 2nd Alex Johnstone, 3rd Mike Bingley. At the same time the Hobie Cats were used for some fun racing. Saturday, December 13, 2014 – Christmas Celebration at Taffy’s Restaurant. This year the PCYC went to Taffy’s for their Christmas Party. Dressed up and in party mood, we all enjoyed great food, fun and dancing. The Secret Santa was played and gifts were received and ‘stolen’ the next minute. For the first time we were not only racing the Hobie Cat’s but also our new addition, the lasers! It was a great day with good wind and blue skies. Besides our old regulars we had newbies competing in our racing and a great group of spectators. The kids built boats and airplanes with bamboo sticks, the boats successfully passed the water tests. Thanks to everybody who raced, helped and made this a great day! Special thanks goes to Le Phare Bleu for providing the venue and StevieB for the great pictures (https://www.flickr.com/photos/stevieb/) Congrats to winners Hobie Cat: Mike Bingley (1st), Stuart Broom (2nd) and Dominic Dore (3rd); Lasers: Robbie Yearwood (1st), Jim Jarrold (2nd) and Curt Mahlstedt (3rd). Many thanks to all the members who came to our AGM. The new board has been elected and ideas were passed on. You can find the Executive Committee on our ‘About Us’ page. Many thanks to everyone who came out for our Thanksgiving Celebration at Villa Beachcliff on Sunday, 26th October. We had much to be thankful for at this event. We enjoyed a delicious turkey dinner and a glass (or two!) of champagne in the company of good friends. We were blessed with beautiful weather. And we were especially thankful for the hospitality of PCYC members, Rick & Karen Feld, who have hosted this event for the past two years at their lovely Villa Beachcliff in Lance aux Epines. Thanks to everyone who came out for our After Work Lime at Prickly Bay Marina on Friday, 10th October. The Tiki Bar is always a popular spot on a Friday night, especially with the yachting community. Not only do folks come for their very social happy hour, but they usually stay for the live musical entertainment which follows. You can dance the night away … and some of our PCYC gang did just that! We had light winds and a few challenging race starts, but we also had a great mix of racers & spectators – including old regulars and newbies to both Grenada and hobie cat racing – so all in all it was a GREAT day on the water and a successful event. Congrats to winners: Ian Jarrold (1st), Pablo Mira (2nd), and Mike Bingley (3rd) – nice to see some newcomers on the podum! Thanks to everyone who attended, Le Phare Bleu for providing the venue, everyone who helped out on race day, and special thanks to Marie-Claude Osterrath for being our race photographer. The PCYC had another fun social gathering at the Victory Bar. With beautiful views of the Lagoon and Carenage in the heart of St. Georges, a great time was had by all. We went to Sangria’s for our After Work Lime last night, which is a lovely spot overlooking BBC Beach, and a great place to do a bit of Limin’ (couple of free tapas when you buy a pitcher of Sangria – yay!) Thanks to everyone who came out. Thanks to all racers and spectators who came out for our hobie cat match races. The day may have started out with rain showers, but blue skies prevailed and we had great winds and fast races with many close and exciting finishes. Congrats to winners: Mike Bingley (1st), Stuart Broom (2nd), and Dave Royce (3rd). Thanks also to Le Phare Bleu for providing the venue. Nimrod’s is always a great spot to do some limin’ and this past Friday was no exception! Thanks to everyone who came out. Even though the skies were gray in the morning and the island got a little bit of blessing the turn-out was good! We had lots of fun going out with our Hobie Cats. Well, we prayed for wind and we certainly got it! We had lots of fun & excitement on the course, along with a few dunks and bumps! Thanks to the 16 entrants who came out to race, and the many spectators who came to watch. Congrats to winners Mike Bingley (1st), Dieter Burkhalter (2nd), and Rene Froehlich (3rd), who are all PCYC members! Thanks to Le Phare Bleu for providing the venue, and the long list of people who helped run another successful day of hobie cat racing. It was another great evening for PCYC members and guests, plus we had a fantastic ‘green flash’ sunset! Thanks to all who came out, and to Umbrellas for having us. We had a great turnout at our After-Work Lime at Sails Restaurant in St. Georges. Not only was it a beautiful location in which to gather – newly renovated restaurant sitting right on the water overlooking the Carenage! – but in addition to the old “regulars” it was great to see lots of new members, and also some of our overseas members who are currently in town. We even had a visiting yachtsman from South Africa! Thanks to Sails Restaurant and to member, Rick Feld, for making arrangements with the restaurant. A great time was had by all at the PCYC Dinghy Crawl where we started at Le Phare Bleu Marina, and stopped along the way for refreshments and club camaraderie at Secret Harbour Marina, Clarkes Court Bay Marina, Taffy’s Bar & Restaurant, Whisper Cove Marina, and Rogers Barefoot Beach Bar at Hog Island. Many thanks to the proprietors of the establishments we visited, and to all members and guests who came out for a fun day on the water. It was an interesting day on the water to say the least…we were having a great time running the Rush 10 Match Races for SGR until one of the Rush 10 masts came down and races came to an immediate halt! Thankfully no one was hurt, and every team got to race at least once in the first heat before this happened, so all racers walked away happy, and we’re counting it as a successful day and more great exposure for the PCYC! 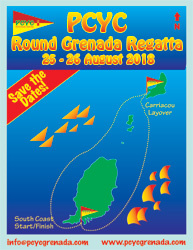 The PCYC had a great time running the Hobie Cat Match Races that Grenada Sailing Week organized for their racers on Lay Day Sunday at Le Phare Bleu Marina. It was pretty interesting watching these big keelboat racers out on our little hobie cats, but the day was a big success and great exposure for our club! We brought Grenada’s two yacht clubs together for our After-Work Lime! We wanted to know each other better, plus together we may be able to do great things that can benefit the Grenada yachting community! 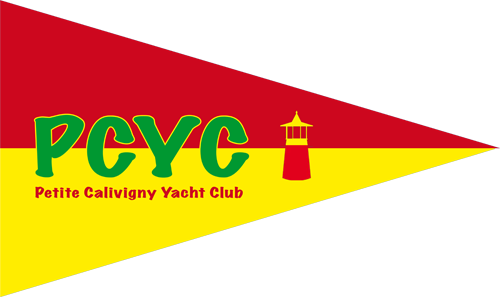 The PCYC swapped burgees and had a great time limin’ with members of the Grenada Yacht Club last night. Many thanks to the GYC for having us over!